I hope you had a lovely holiday season. Ours was very nice, but you know, never without a particularly memorable experience. Right before Christmas this year, we had a small gathering of family here at the house for Festivus. Festivus is a Seinfeld-inspired holiday where you put up a pole instead of a tree, air your grievances and compete in feats of strength. Tradition states that Festivus doesn’t end until someone pins the head of the household in a wrestling match. The traditional Festivus meal is meatloaf, so I made meatloaf sliders, and then we had bagel bites pizzas for the kids and a sub tray. We also planned to play board games instead of performing those feats of strength. I had a pole, which was a shower curtain rod that had fallen down in the hall bathroom, so we set that in the living room across from our traditional Christmas tree. Before the party, Manfrengensen told me that I could hire someone to clean the house. This was a pretty exciting prospect, because it’s very rare that I have the WHOLE house clean all at the same time. I can do it over a week’s time, but then, as soon as I finish, it’s time to start over, right? And because I am so diligent a housekeeper, I am forever on this gerbil wheel and have almost nothing else to do with my time. Ahem, ahem, ahem. So, I asked around, and a friend knew someone who was available on the 23rd, which was also the day of the Festivus party. So that was great. I could cook all the food on Thursday and mess up the kitchen, then the next day, all the evidence would be wiped away. In addition to that plan, we were less diligent about cleaning up after ourselves. I felt like we were living in the fish tank of Finding Nemo and planning an escape. If you are any kind of regular reader of this blog, I think you know how my well-laid plans usually tend to work out, right? Thursday, while I was out buying all the ingredients for my Festivus feast, the house cleaner called to say that because her partner was ill with pneumonia, she would be unable to help us. So I panicked. The house was a mess, plus I had laundry, cooking and a number of other Christmas-related tasks yet to be accomplished. I did not have time in those 24 hours to get the house company-ready. I called around and found one cleaning service, Merry Maids, that had a slot that was even available on the Friday before Christmas, so I hired them. Never mind the price (which was 40% higher because of the holiday), I just wouldn’t tell Manfrengensen unless he asked (which he did) and if need be I still have two kidneys, so I could always sell one to cover the nut. Right? Two women showed up early Friday morning and began to clean upstairs. Manfrengensen took the kids out to do their Christmas shopping, and I came in here to the office to clean what had basically become our “catch-all” room (see End of Year Musings: Week 2 for evidence) and the morning flew by. The whole time, I wanted it clean, but also wanted it fast because they bill by the hour. I was still in the office when one of the ladies started in the kitchen. For some reason, she decided to take the stove apart, and in the center, there’s a grill that I never use because how the heck am I going to clean that? It’s covered by a large steel rectangular cover. So I heard her taking it apart, and I was thinking it wasn’t necessary, but I didn’t want to tell her how to do her job, and not long after that I heard what was obviously some kind of injury, or a reaction to some kind of injury. I waited a minute before going in to see if she was okay. I didn’t want to crowd her, but if it was serious, of course I wanted to help in any way possible. Well, it was serious. I mean, she needed stitches. She had cut her finger as if with a straight razor, deep and throbbing. She couldn’t get it to stop bleeding. They called their office to get someone to replace her, but no one was available. I felt really helpless. I wanted her to be okay. I wanted her to go to the ER. But at the same time, I wanted someone to come and finish cleaning the house. I didn’t say that of course, I just kept handing her paper towels, gauze and band-aids, which she proceeded to soak through in short order. 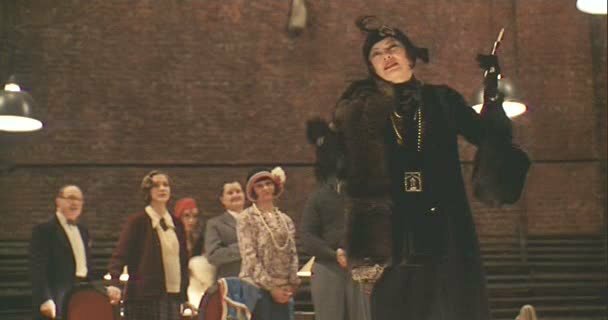 I felt a bit like Diane Weist’s self-centered actress character, Helen Sinclair in the Woody Allen film Bullets over Broadway. I don’t have a clip, but there’s this scene where Helen shows up late for rehearsal, giving the reason that her pedicurist suffered a stroke and fell forward, plunging the orange stick into Helen’s toe. “It required bandaging,” she adds as if it’s the most important detail of the story. I know — I can pretty much attach any event in my life to something in a movie. Gift or curse? That’s for you to decide. Anyway, long story short (too late) they finished cleaning the house. (A Festivus miracle!) I felt awful for this poor woman, and two days before Christmas! From that point she did the dusting, nothing wet, and the other woman handled all the other stuff. Despite going through half a roll of paper towels and all the gauze and band-aids I had in the house, she was still bleeding badly enough to have to change the dressing every twenty minutes or so by the time she left. She just shrugged and said no. She and her partner had two more houses to clean that day! I felt so bad for her.